Q. 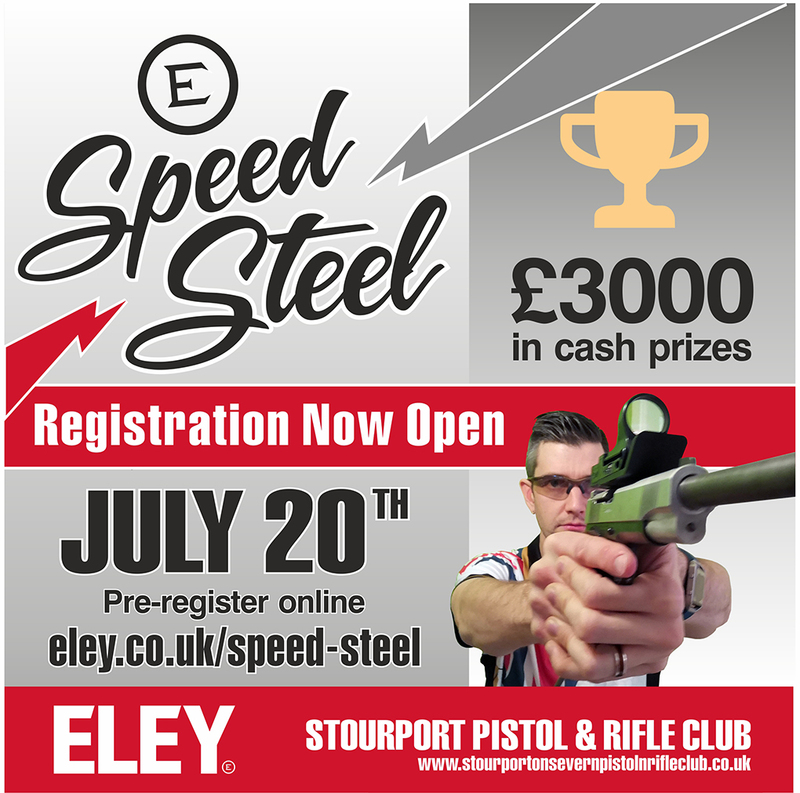 How many matches are taking place in the ELEY Speed Steel Challenge? A. Three. The dates in 2019 are 20th April, 20th July and 12th October. Q. Where are the events being held? A. Stourport Pistol and Rifle Club. Q. How much is it to enter a Speed Steel Challenge match? Q. What is included in my match fee’s? A. 8 stages are included per entrant, per discipline, 5 runs per stage. Q. Why are moderators not allowed? A. Stourport Pistol and Rifle Club has limited space, therefore our stages are positioned closer than the traditional layouts. This will ensure accurate and consistent timing. Q. What are the steel plate sizes and stage layouts? A. Our stage layouts will be similar to the traditional USA layouts and plate sizes will be the same. A. Each competitor will be placed in a squad of 8 shooters. Each shooter will compete in 8 stages, each stage consists of 5 runs, shooting 5 plates. After completing a stage, the shooters slowest time out of the 5 runs will be eliminated. The four fastest times will be your time for that stage. The winner will be determined by the fastest time after 8 stages. Q. Is the gun drawn from a holster? A. No, Starting at 45 degrees or pointing at a mark on the ground, gun safety off and finger out of the trigger guard. You may engage the target after the buzzer sounds. Q. Do I need a FAC and Competition licence? A. FAC = Yes you will require to show your valid FAC licence at registration. Q. Can I hire a gun? A. You can hire a rifle but you can not hire a pistol. Q. Who is collecting payment and can I pay on the day? A. Pre-registration is required via Stourport PRC’s PayPal account. The organiser is Rob Forbes and the club’s PayPal account is ‘English rob 54’ You can only pay on the day for one additional entry. Q. How may entrants are you accepting? Q. Do I have to use ELEY ammunition? A. We would love you to use ELEY ammunition but it is not compulsory. 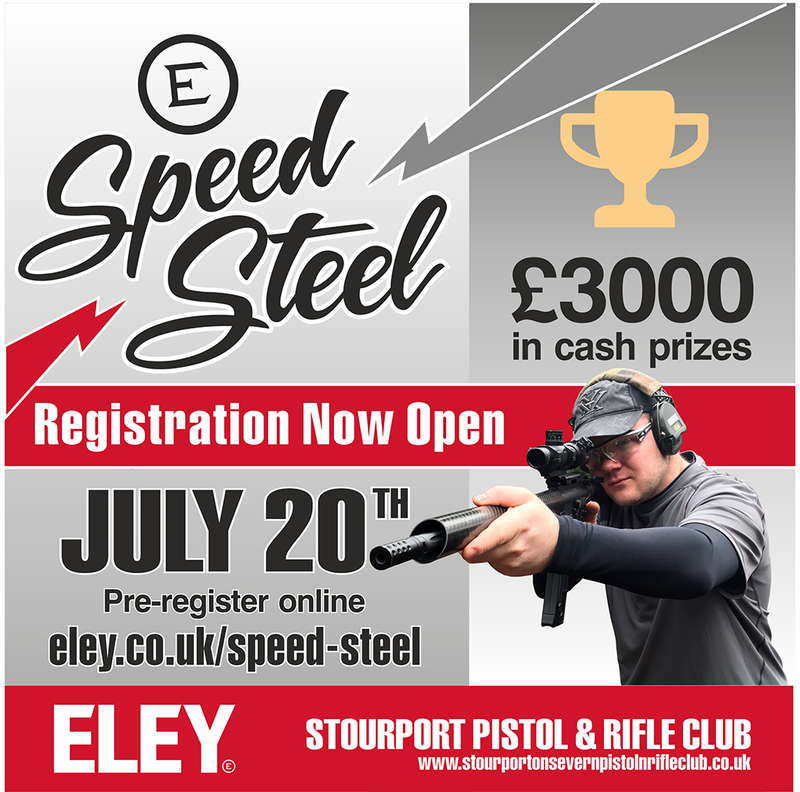 Any competitor finishing in the top three positions in either discipline using ELEY ammunition will receive an additional £100 to their prize money. A. Both disciplines: £750 for 1st position, £500 for 2nd position and £250 for 3rd position. On the day we will have ‘Special’ stages with additional ELEY prizes for fastest times. Q. Is the prize money for each event or the whole series? A. Each single event. Over 9k in cash prizes. Q. How can I help advertise this event? A. Please right click and save our social media advert at the bottom of this page and share it on your social media platforms. We appreciate your help in growing what we are determined to make the largest Steel Plate Challenge in the UK. Get involved in the UK’s largest Steel Plate competition series. Event one – LBP £750 first place, £500 second place, £250 third place. Mini Rifle £750 first place, £500 second place, £250 third place. Random stage prizes when entering twice or competing in both disciplines. Enter either division, Long Barrel Pistol, Mini Rifle or both. (No Lasers or Moderators). Select your payment option below and complete the PayPal form. The Stourport team will take care of the rest. 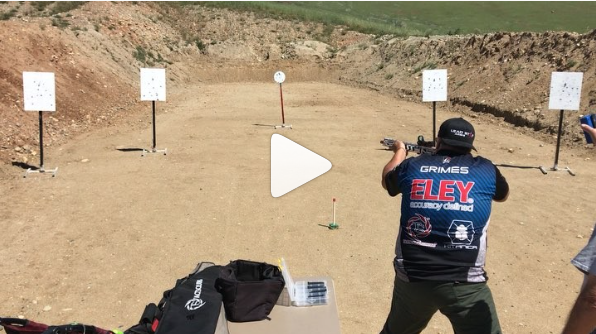 Kurt Grimes gives a quick demo on shooting a stage in Steel Plate! 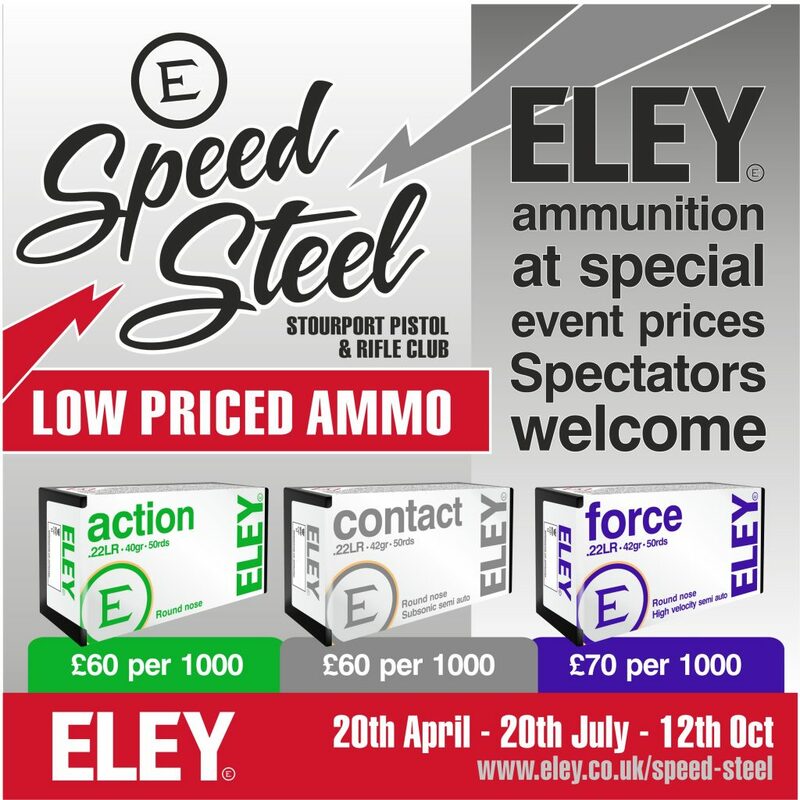 Help us promote the ELEY Speed Steel event by sharing our advert across your social media channels. We will have some ELEY swag for you at the event.